Every Xamarin.Forms view has an accompanying renderer for each platform that creates an instance of a native control. When a View is rendered by a Xamarin.Forms application in iOS, the ViewRenderer class is instantiated, which in turn instantiates a native UIView control. On the Android platform, the ViewRenderer class instantiates a View control. On the Universal Windows Platform (UWP), the ViewRenderer class instantiates a native FrameworkElement control. For more information about the renderer and native control classes that Xamarin.Forms controls map to, see Renderer Base Classes and Native Controls. Create the HybridWebView custom control. Create the custom renderer for the HybridWebView on each platform. A Uri property that specifies the address of the web page to be loaded. A CleanUp method that removes the reference to the registered Action. An InvokeAction method that invokes the registered Action. This method will be called from a custom renderer in each platform-specific project. The local namespace prefix can be named anything. However, the clr-namespace and assembly values must match the details of the custom control. Once the namespace is declared, the prefix is used to reference the custom control. 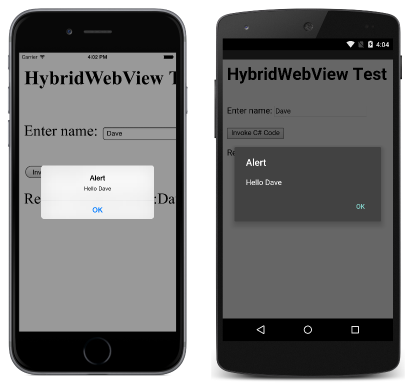 This action calls the DisplayAlert method to display a modal pop-up that presents the name entered in the HTML page displayed by the HybridWebView instance. Create a subclass of the ViewRenderer<T1,T2> class that renders the custom control. The first type argument should be the custom control the renderer is for, in this case HybridWebView. The second type argument should be the native control that will implement the custom view. Override the OnElementChanged method that renders the custom control and write logic to customize it. This method is called when the corresponding Xamarin.Forms custom control is created. Add an ExportRenderer attribute to the custom renderer class to specify that it will be used to render the Xamarin.Forms custom control. This attribute is used to register the custom renderer with Xamarin.Forms. For most Xamarin.Forms elements, it is optional to provide a custom renderer in each platform project. If a custom renderer isn't registered, then the default renderer for the control's base class will be used. However, custom renderers are required in each platform project when rendering a View element. The ViewRenderer class exposes the OnElementChanged method, which is called when the Xamarin.Forms custom control is created to render the corresponding native web control. This method takes an ElementChangedEventArgs parameter that contains OldElement and NewElement properties. These properties represent the Xamarin.Forms element that the renderer was attached to, and the Xamarin.Forms element that the renderer is attached to, respectively. In the sample application the OldElement property will be null and the NewElement property will contain a reference to the HybridWebView instance. An overridden version of the OnElementChanged method, in each platform-specific renderer class, is the place to perform the native web control instantiation and customization. The SetNativeControl method should be used to instantiate the native web control, and this method will also assign the control reference to the Control property. In addition, a reference to the Xamarin.Forms control that's being rendered can be obtained through the Element property. A new native control should only be instantiated once, when the Control property is null. The control should only be configured and event handlers subscribed to when the custom renderer is attached to a new Xamarin.Forms element. Similarly, any event handlers that were subscribed to should only be unsubscribed from when the element the renderer is attached to changes. Adopting this approach will help to create a performant custom renderer that doesn't suffer from memory leaks. Each custom renderer class is decorated with an ExportRenderer attribute that registers the renderer with Xamarin.Forms. The attribute takes two parameters – the type name of the Xamarin.Forms custom control being rendered, and the type name of the custom renderer. The assembly prefix to the attribute specifies that the attribute applies to the entire assembly. The invokeCSCode function calls the log function to display the data it is sending to the C# Action. It then calls the invokeCSharpAction method to invoke the C# Action, passing the parameter received from the input element. On iOS, this HTML file resides in the Content folder of the platform project, with a build action of BundleResource. On Android, this HTML file resides in the Assets/Content folder of the platform project, with a build action of AndroidAsset. The custom renderer creates a native web control and loads the HTML file specified by the HybridWebView.Uri property. When the user enters their name and clicks on the HTML button element, the invokeCSCode function is invoked, which in turn invokes the invokeCSharpAction function. The invokeCSharpAction function invokes a method in the custom renderer, which in turn invokes the HybridWebView.InvokeAction method. The HybridWebView.InvokeAction method invokes the registered Action. The following sections will discuss how this process is implemented on each platform. A WKUserContentController instance is created, which allows posting messages and injecting user scripts into a web page. The WKUserContentController.AddUserScript method adds the WKUserScript instance to the content controller. A WKWebViewConfiguration instance is created, with the WKUserContentController instance being set as the content controller. A WKWebView control is instantiated, and the SetNativeControl method is called to assign a reference to the WKWebView control to the Control property. The WKWebView class is only supported in iOS 8 and later. The SetNativeControl method is called to assign a reference to the native WebView control to the Control property. The WebView.LoadUrl method loads the HTML file that's specified by the HybridWebView.Uri property. The code specifies that the file is stored in the Content folder of the project. Projects that use the [Export] attribute must include a reference to Mono.Android.Export, or a compiler error will result. Note that the JSBridge class maintains a WeakReference to the HybridWebViewRenderer class. This is to avoid creating a circular reference between the two classes. For more information see Weak References on MSDN. The SetNativeControl method is called to instantiate a new native WebView control and assign a reference to it to the Control property.